This is the third post in a weekly series highlighting Italy’s four World Cup wins from qualifications to the finals. Read the second post here. Italy hosting the tournament was going very successfully. There was record attendance, especially at the Azzurri matches. Also, for the first time, the matches were broadcast on the radio in 12 of the participating countries, bringing the games to an even more global audience. To reach the finals, Italy were going to have to face their worst nightmare: the Austrian Wunderteam. Meisl’s team was the most feared by anyone, but Italy had an especially good reason. Italy had lost to Austria in a friendly in Florence just 4 months prior to the tournament, with a score of 4-2. They especially feared a certain “Paper Man,” Matthias Sindelar. Sindelar may have been nicknamed for his slight frame, but he was incredibly graceful, and the key to Austria’s passing game. He could be the key to their success or the key to their demise, depending. And so it was, that at the San Siro in Milan before a crowd of 60,000 on June 3rd, the two footballing giants would determine who would play in the semifinal. The referee was Sweden’s Ivan Eklind, and of course Benito Mussolini was there to remind everyone of the true purpose of this tournament. The weather was awful, there was heavy rainfall and the pitch was heavy and muddy. Although this was Italy’s third match in four days because of the replay with Spain, they showed incredible stamina and determination. With a little help from the rain, they were able to effectively shut down Sindelar and Austria’s passing game. A shot by Schiavio in the 19th minute was rebounded out by the keeper and Guaita was able to kick it right back in for the goal. Austria came back fighting in the second half, but Italy Captain Combi’s amazing display in goal kept the Wunderteam shut out, and Italy hung on to win 1-0. Austria’s winning streak was ended with a bonus trip home, and the Azzurri would head to their first World Cup final. A great tribute to Combi, an Italian goalkeeping legend who would hang up his Azzurri boots following the tournament. The other Semifinal took place simultaneously in Rome, where Oldrich Nejedly scored a hat trick to send Czechoslovakia past Germany 3-1, and on to the Final. 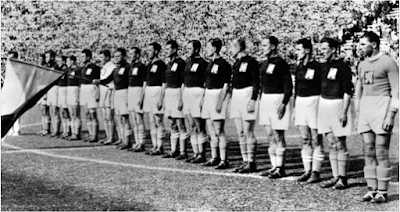 On June 7th, in Naples, the first ever third place match was held between Germany and Austria. As if to punctuate the downfall of the Wunderteam, Germany beat Austria 3-2. 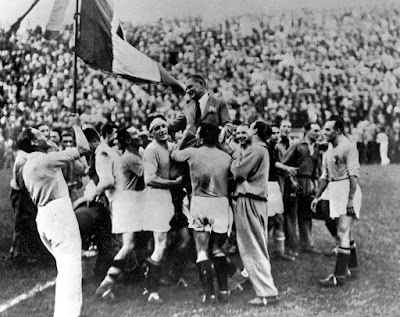 But the big game took place on June 10th in Rome in the Stadio Nazionale PNF in front of 50,000 spectators, including the ever present Benito Mussolini. The Swedish ref, Ivan Elklind, was again the match official. Czechoslovakia, also known for their short passing game a la Danubian method, had a formidable keeper in Franisek Planicka. They also touted Oldrich Nejedly, whose semifinal hat trick and two other tournament goals was the frontrunner for the Golden Shoe. 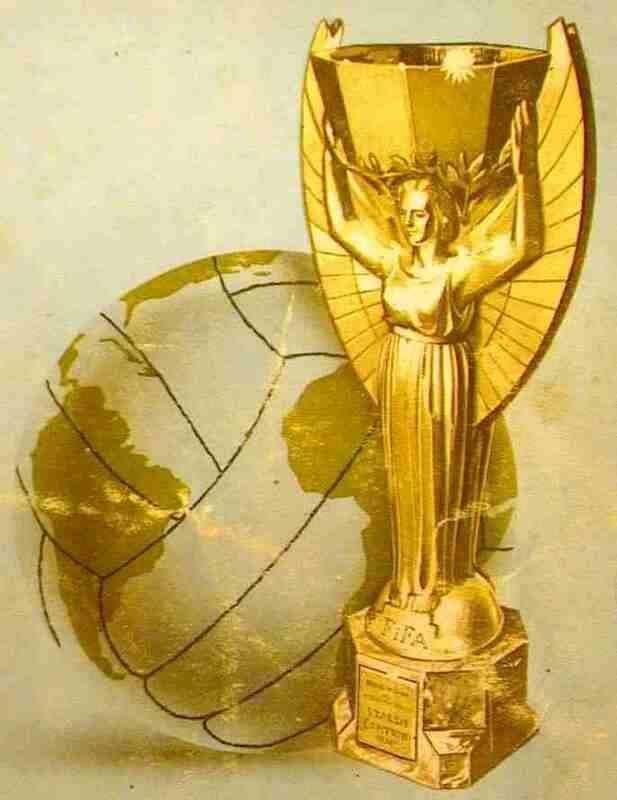 Czechoslovakia had played arguable the most consistently entertaining football of the tournament, and definitely deserved to be in the final. 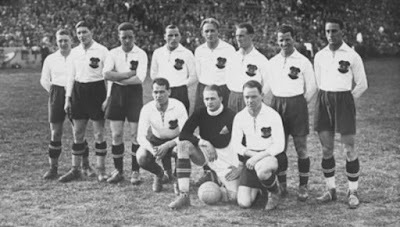 The game itself was fierce and marked by the Czechs skillful and entertaining play as well as the Italians’ powerful style, coupled with their defining stamina. And so it wasn’t until the 70th minute that the deadlock was broken. Czechoslovakia had won a corner, which Puc took. When the ball inevitably wound up back at his feet, he fired a powerful wondergoal from an impossible angle, one that Combi or anyone else could not have stopped. So the home team are down 1-0, and the Czechs get another great shot from Svoboda that hit the post. But the Azzurri were not giving up. In the 80th minute, their focus and relentless determination were rewarded when Orsi ran through the Czech defense, faked a shot with his left foot, then shot with the outside of his right foot to send a wicked curler past the Czech keeper to equalize. On to added extra time. Coach Pozzo made an unusual move and had Guaita and Schiavio switch sides, which would prove a stroke of genius. The Italians were the most fit and had greater stamina, so overtime would favor them. But they were also weighed down with an injured Meazza, so it was actually anyone’s game. 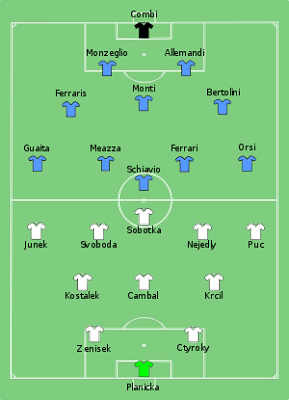 Except that the limping Meazza ended up being Czechoslovakia’s undoing. He was left unmarked, given his lessened abilities, and so he was easily able to cross the ball into Guaita who passed it to Schiavio, who was able to then beat a defender and the keeper to eek the ball just under the crossbar for the winning goal. A goal that may have never happened were it not for Pozzo’s daring swap and Meazza’s injury that left him completely open. Italy were World Champions! Coach Pozzo was carried off the field on the shoulders of the players, and became a national hero. Celebrations began in Rome and spread throughout the country. For their efforts, Mussolini immediately ordered that each player would receive $17,000 each for their success. A small price to pay for the people who successfully carried out his political agenda, even if unwittingly. Czechoslovakian Oldrich Nejedly did win the golden shoe, even if he wasn’t able to score in the final. Monti won his champions’ medal, which, along with his runners-up medal he won playing for Argentina in Uruguay in 1930, gave him the distinction of being the first and only player to win consecutive World Cup medals with different nations. This World Cup would be remembered for violent play, questionable reffing, and Mussolini’s political agenda. After each win, there would be rallies across Italy to promote his propaganda. However with that regime long gone, Azzurri fans today simply remember it as their first sweet victory. 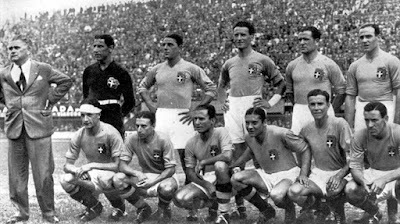 And regardless of the questions of refs and violence and pressure from Mussolini to ensure his team won, our boys in blue went out and played their hearts out, with unparalleled stamina and a hunger to win. So even if those other things happened behind the scenes, it is likely the outcome would have been the same anyway. This is part three of a 12 week series I originally wrote for the now defunct Italy World Cup Blog five years ago. The series will now appear here weekly as a tribute to the Azzurri teams of the past.